Yesterday evening, I was privileged to be able to witness current world chess champion Magnus Carlsen in action. 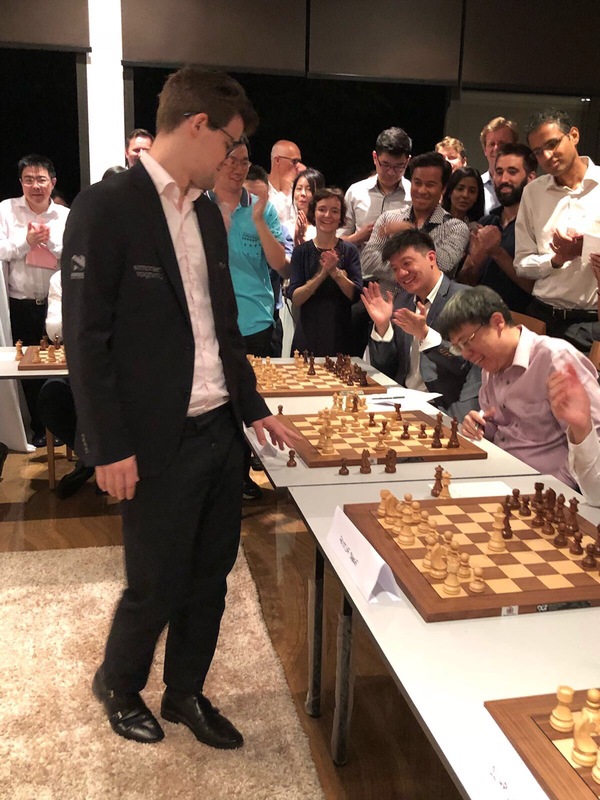 In an event organized by the Norwegian Business Association and Simonsen Vogt Wiig law firm, Carlsen played a simul exhibition against 16 opponents at the Norwegian Ambassador’s Residence. The “opposition” were all chess amateurs, ranging from novices to the extremely strong IM and 6-time Singapore champion Kevin Goh Wei Ming. There were only 3 other players I recognized – chess historian Olimpiu Urcan, Joshua Lim Geok Hock who was a childhood chess adversary, and Dr Lee Chien Earn who is CEO of Changi General Hospital and father of one of our strongest chess juniors. Many members of the Ministry of Health (MOH) chess team – including the Dean of YLLSOM and the SGH Microbiology Department blogger – were able to attend the event. Members of Chess Club Balestier, including top chess coach Junior Tay (photo courtesy of IM Kevin Goh). Simul participants waiting for the start of the event. Coincidentally (or not), the three players who were to give Carlsen the most trouble were all in a row. A closer view of NM Olimpiu Urcan, chess author and historian. The world champion played quickly and confidently, moving from board to board at an almost rhythmic pace. He paused the longest over his game against IM Goh Wei Ming, as one might expect. In that game, arising from an English opening, he almost got into trouble against Wei Ming’s opening prep, but made a number of remarkable decisions that kept the tension in a deceptively calm position. Wei Ming was able to keep up for a while, but as more and more of the other players lost and Carlsen returned to his board at shorter and shorter time intervals, he finally blundered a pawn in a double rook and bishop vs. Carlsen’s double rook and knight endgame. After that, despite only thinking a few seconds each time, the world champion demonstrated ruthless technique. It has always been a learning experience to go through Carlsen’s endgames, but a special treat to witness it in person. An early stage of the game. IM Kevin Goh had just played Re8 threatening a discovered check, but the world champion played the classy Bd3!? allowing the threat to be executed in exchange for harmonious piece development. An incredibly concrete decision during a simul exhibition. National master (NM) Olimpiu Urcan had come well prepared, and was able to play out the moves from a recent Carlsen game against the man himself. He seemed to achieve a decent position, but was squeezed in the middle-game and landed in a difficult endgame, conceding the game after losing a pawn. Dr Lee Chien Earn defended against Carlsen with a solid but somewhat passive Ruy Lopez, and was the last man standing against the world champion (earning a round of applause). But he was finally unable to withstand the undivided focus of Carlsen, and had to resign. 16-0 against a field that included several strong players! The last man standing – Dr Lee Chien Earn – finally calls it quits against the world champion. Photo courtesy of Joshua Lim Geok Hock. After the games, Carlsen gave an additional treat by commenting on several of the games that had made an impression on him. He also gamely stayed on for quite some time for autographs and photos with the other players and members of the audience. All in all, an amazing event and I am grateful to the Norwegian Business Association and Simonsen Vogt Wiig law firm for the opportunity! A photo of the MOH chess team with Magnus Carlsen. Photo courtesy of Alvin Ong.